The announcement came in the wake of a meteor explosion over Russia that left hundreds of people injured, and just hours before asteroid 2012 DA14, a space rock about half the size of a football field, was to give the Earth an extremely close shave. "Today's events are a stark reminder of the need to invest in space science," Rep. Lamar Smith (R-Texas), who is chairman of the committee, said in a statement. Asteroid 2012 DA14 will pass just 17,200 miles (27,000 kilometers) from Earth, less than the distance of a round trip from New York to Sydney, Smith added. "And this morning, a much smaller meteorite hit near the Russian city of Chelyabinsk, destroying buildings and injuring hundreds." 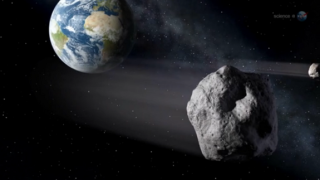 Smith called for continued investment in technologies to identify and track near-Earth asteroids like 2012 DA14 and for the development of contingency plans to deflect space rocks that might be on a collision course with Earth. "Fifty years ago, we would have had no way of seeing an asteroid like this coming," Smith said. "Now, thanks to the discoveries NASA has made in its short history, we have known about 2012 DA14 for about a year. As the world leader in space exploration, America has made great progress for mankind. But our work is not done. We should continue to study, research, and explore space to better understand our universe and better protect our planet."